If you looking for a fun and relaxing way to spend time with your family on the water instead of in the water, then Sail Wild Hearts is for you. You can’t imagine a more perfect day to go sailing. The sun was shining and there was a late summer breeze. Sail Wild Hearts owner, Ted Scarritt, was more than thrilled to have us on a sail. 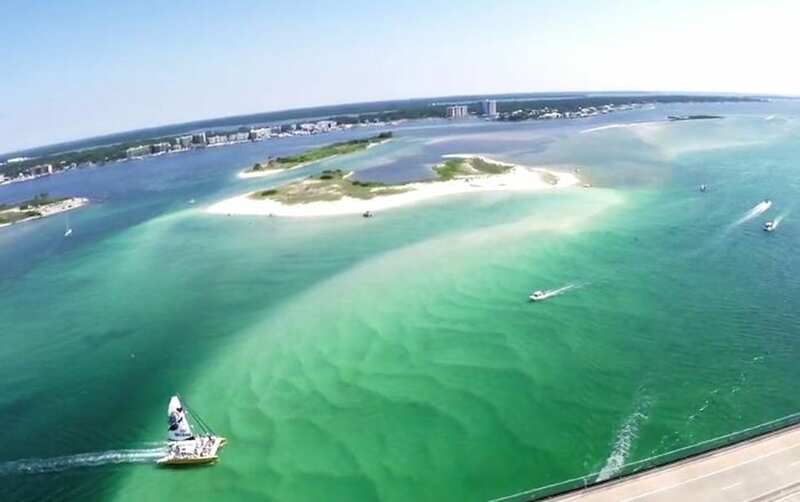 The dock is located in the heart of Orange Beach about a mile from Turquoise Place, a Spectrum Resorts’ property. Growing up in the area, I’ve spent plenty of time cruising the Gulf and the back bays in center consoles, pontoon boats and jet-skis, but hitting the open water on a sail boat was a new experience for me. First, I was surprised at just how fast the boat was able to move with only the wind pushing us along. It also made for a much quieter and relaxing boat ride being able to hear the breeze and the water instead of the constant scream of a boat motor. The boat is stunning in and of itself. At 53 feet long, Sail Wild Hearts is easily the largest boat that I’ve been on, and the open deck provides a ton of room for everyone to make their way around the boat comfortably. The crew was very hospitable and took the time to explain some of the finer points of sailing a boat so large. If you’re looking to get out of the sun, the cabin area is also very spacious with plenty of seating. You’ll also find two restrooms and even a bar below deck. I have had the pleasure on sailing Wild Hearts before and each trip brings something completely different. Even the dock walk is a time to take it all in and enjoy the natural settings. Wild Hearts was immaculately clean and there were cold drinks and snacks waiting. We started to set sail immediately and when passing the islands, I had memories of me on Robinson Island wishing I was on Wild Hearts when it passed by. Imagine the sweet sound of Mother Nature’s cool breezes, the sight of pure-white beaches and the Gulf of Mexico. Being on the water is completely relaxing for me, especially knowing that the next couple hours are a ‘Calgon Take Me Away” moment. It was nice to see the Alabama Gulf Coast from a different perspective. The gulf view has another meaning when out in the Gulf looking in. The sail was perfect because of the friendly and professional crew and the quite sounds you can only hear without a motor. Thank you for sailing away with us on Sail Wild Hearts. For additional information on other must do area activities, click the link below. We are looking forward to you reading about our next trip to Lulu’s at 5’Oclock Somewhere in Gulf Shores. Comment below and tell us at Spectrum Resorts where you ike to go.